Wedding band designs can be just as elaborate as engagement rings and finding the perfect wedding bands for women can be difficult. In addition, planning a wedding is monetarily and emotionally demanding. Wouldn’t it be great if you could find cheap wedding bands for women that were still made with quality gems and metal? Try shopping for wedding band sets for women at AZEERA. We allow you to customize the gemstone, metal, and engraving in ring creating unique women’s wedding band sets. 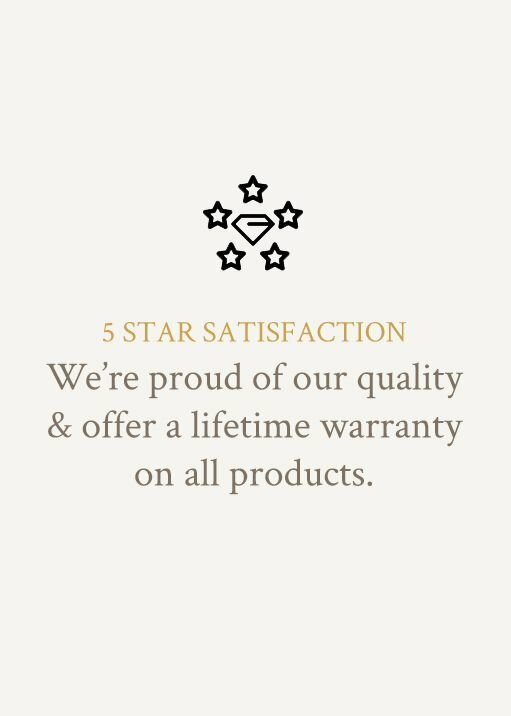 We also have a team of gemologists and designers on staff to guide you through the process of finding and creating unique wedding bands for women. Amethyst – This purple gem looks fantastic in thin wedding bands for her with rose gold. The slender design would highlight the prominence of the color. In addition, the deep hues look stunning individually or they can be pair for diamonds to create unique wedding bands for her that pop out. Aquamarine – Typically found in estate jewelry, aquamarine is perfect for vintage wedding bands for women. Large gems especially are associated with heirloom pieces that have been passed down for several generations. You will not fail in creating beautiful wedding bands for her with aquamarine. Black Onyx – A modern black gem that looks stunning on its own and compliments another gems to enhance their color. Black onyx is a budget friendly alternative to black diamond and is perfect for modern unique women's wedding bands. Blue Sapphire – There is nothing more timeless than women’s sapphire wedding bands. You cannot go wrong with blue sapphires in an eternity setting. Either by itself or with diamonds, sapphire wedding bands for her are a must have piece in every women’s jewelry collection regardless of the occasion. Citrine – Citrines are delightful gem that go well in wide wedding bands for her. In comparison to yellow diamonds, citrine is much more budget friendly and you are able to get larger gems for less. With wide women’s wedding bands, you can a disco ball’s worth of gems on your finger. Diamond – The most traditional choice for wedding band gems is diamond. The pristine white stone looks good in any metal with any design. The most common choice for diamonds is in a micro pave or eternity setting. 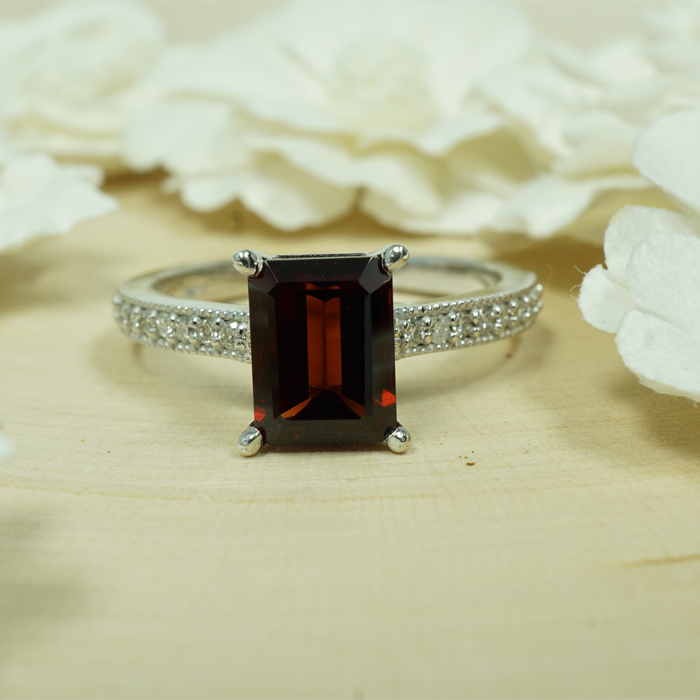 Garnet – This gem is mostly popular because it is a birthstone, but you can also design in unusual women’s wedding bands because the color is so unique. The deep orange red stands out on it’s own and evokes feelings of passion. 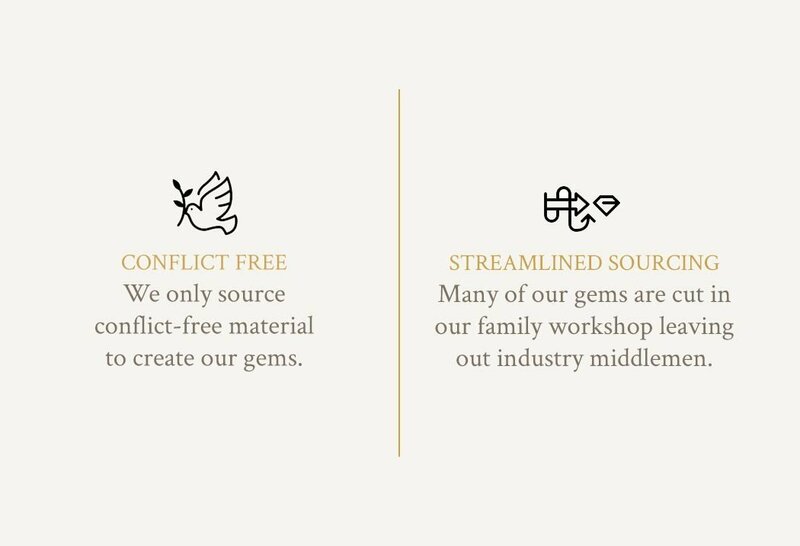 Garnet is another affordable gem and we recommend you to try it in a half eternity setting with larger gems. Peridot – The best way to appreciate peridot is in wide wedding bands for women. This allows for larger gems to be in the setting. When peridot are cut into tiny stones, the gem loses the vibrant color that its know for, so that is why we recommend using peridot in larger and wider settings. Pink Tourmaline – This bubble gum pink gem is truly special in the gem world. The color is especially feminine and allows for you to create women's unique wedding bands effortlessly. The pink color is also versatile and can easily be paired with Aquamarine, Citrine, Peridot, and Swiss Blue Topaz. Ruby – The color red will always be associated with Ruby. It is the premier red gem in the jewelry world and is found in all high-end designs. Ruby can be in any women’s wedding band styles, but our favorite is the Art Deco setting, which is known for its use of basic colors and shapes. Swiss Blue Topaz – This vibrant electric blue gem is perfect for modern designs. The bright color pairs well with bolder styles that are designed to make a statement. 14k Gold Wedding Bands for Women – Of all the golf wedding bands in the category of fine jewelry, 14k gold wedding bands for her are the most durable. Pure 24k gold on it’s own is very soft and malleable. That is why other metals are added into the alloy to create a resilient piece of jewelry. Even a 14k women's thin white gold wedding band will do well with everyday wear. 18k Gold Wedding Bands for Women – This type of women’s gold wedding bands has a higher percentage of gold, making it a more luxurious option. Even though a gold 18k women’s wedding band is softer, it can withstand daily wear. Vintage gold wedding bands for her and 18k yellow gold go well together. Yellow Gold Wedding Bands for Women – Yellow is the most commonly associated color with gold as it is natural color. Yellow gold wedding bands for her are excellent as antique and classic designs. You also do not need to re-plate the ring. Rose Gold Wedding Bands for Women – Rose gold was first used in the 19th century and now it has recently become a popular staple in jewelry. The color in rose gold wedding bands for her is derived from copper that is added to the alloy mixture to strengthen cold. A women’s rose gold wedding band looks with soft colored gemstones such as aquamarine and peridot. White Gold Wedding Bands for Women – Most white gold women's wedding bands are alloy with any combination of nickel, manganese, or palladium to achieve the white color and improve durability. A rhodium plating is also added to white gold wedding bands for her to improve the luster. A 14k white gold women’s wedding band can be paired with a modern design to create a stylish piece of jewelry. Palladium and Platinum Wedding Bands for Women – The most durable and heaviest options for precious metals are palladium and platinum wedding bands for her. In terms of price palladium is similar to the price of gold and makes cheap wedding bands for her, while is premium and very rare. A platinum women's wedding band looks similar stunning in a vintage setting with large a center stone. We can help you create the perfect piece from sketch to finish in 10 days.